I love your pug! What a cutie. Awww sooo cute! :) I love that outfit too! Igby is such a little cutie. I was saying to my husband that I am not a fan of pugs because they have a weird look. But I have to say your pug is the absolute cutest pug ever! 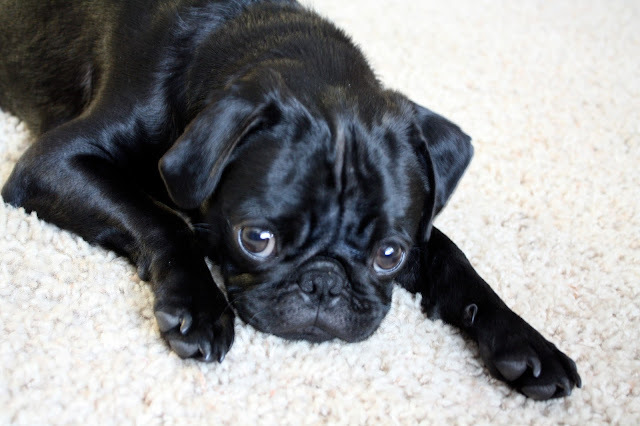 I am seriously considering a black pug now! I melt at the sight of puppies and dogs. It seems not too long ago that Igby was just a little runt! Tha pants - fab! The pug - super cute! I was just going to say "oh my goodness, her puppy has gotten so big! ", Igby makes me wish for a dog every time I see him. You both are looking great! They grow up so fast! My doodle is 7 months and monstrous. Still sweet though..there is nothing like a puppy. What brand are your jeans? I've been looking for a pair of high-waisted ones and they seem pretty wearable. This a beautiful casual chic outfit! Perfect for this transition into March. Yep, Igby is getting big. What a cute look on his face! I wanted to say before that I really like your new haircut. It frames your face so well and REALLY makes you look so adorable! Out of the past 3 styles I think this one is the absolute best!! oh my gosh! those jeans! I love this simple casual outfit. And Igby is so cute! He's gotten so big!! what a cutie pie! Love the look with the wideleg trousers. sigh, seeing that sweater makes me sad. i bought it probably 7 or 8 years ago and at some point i consigned it. sad, sad, sad. it's still great and i wish i still had it. you look cute! I'm in love with Igby!! I used to have a black pug named Olive. Now I have an energetic, sweet fawn baby named Gidget.